History: Scottie Pippen better known as “PIP” received his first signature shoe from Nike before the ‘96/’97 Season. Even though he’s arguably the greatest wing defender in NBA history, six NBA Champions and a perennial All Star, Pippen was overshadowed by his running mate, Michael Jordan. Overtime Pippen eventually received the credit he deserved, as PIP and MJ are still recognized as the greatest 1-2 combo in NBA history. His first signature shoe was a big step in recognizing his accomplishments. Inspiration for the Shoe: The smooth flowing lines represent Pippen’s style and approach towards the game. Pippen did it all; he was the glue guy before there was a glue guy. Pippen’s name is on the tongue and the back of the shoe. Signature Moment: His signature moment in ‘96/’97 came in game Game Six of the NBA Finals when he stole the inbound pass and knocked the ball ahead to Tony Kukoc in the closing moments, sealing his 5th NBA championship. It’s only suiting that Pippen, who was known for his lockdown defense, came up big when it mattered most. Random Fact: He was named one of the 50 greatest players in NBA history during the ‘96/’97 season. 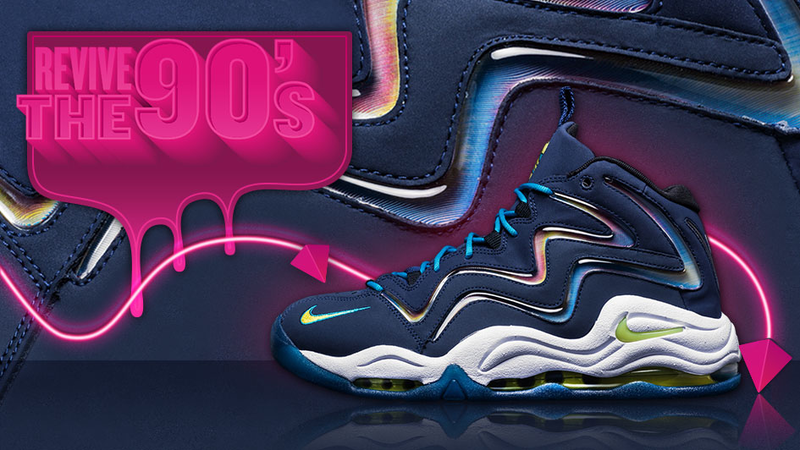 Get a pair of the Nike Air Pippen 1 and check out other ‘90s kicks.